Targeting regional language users with their latest mobile phones, Ziox Mobile, one of the youngest mobile companies in India has partnered with Reverie Language Technologies’ for its language based mobile solutions. Ziox Mobile’s upcoming phone models are expected to come pre-stalled with Reverie’s language apps. 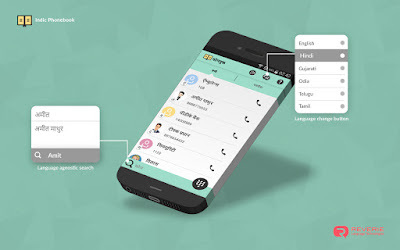 Reverie’s Indic Keyboard Swalekh Flip helps consumers type in Indian languages. Then there’s Indic Phonebook, which is the default contact app on Ziox’s phones and will help the latter’s consumers save, search and read their contacts in 11 languages. In this manner, Ziox mobiles will offer regional language equivalents for the most popular requirements of a mobile phone - making calls and sending messages. Indic Keyboard Swalekh Flipis an intuitive keypad which enables a user to type in their language of choice. It supports all 22 official Indian languages - Hindi, Bengali, Telugu, Marathi, Tamil, Gujarati, Kannada, Malayalam, Odia, Punjabi, Assamese, Nepali, Bodo, Dogri, Konkani, Maithili, Manipuri, Sanskrit, Kashmiri, Sindhi, Santhali, Urdu and English. Indic Phonebook - In India, mobile phones are used mostly for calling and sending messages and therefore, accessing contacts are key. Reverie’s Indic Phonebook on the Ziox Mobile smartphones will allow users to SAVE, SEARCH and READ the phone contacts in their language of choice truly making itIndia’s onlytrue language agnostic phonebook. Indic Phonebooksupports 11 Indian languages- Hindi, Bengali, Telugu, Marathi, Tamil, Gujarati, Kannada, Malayalam, Odia, Punjabi, Assamese and English.